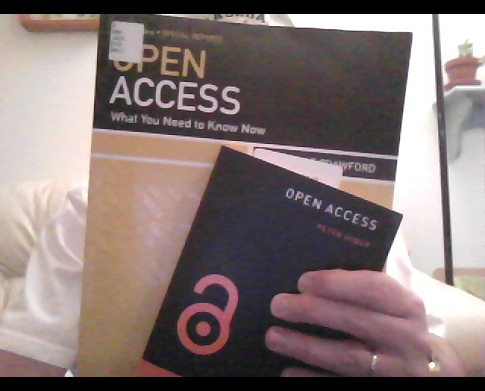 I finished these two Open Access books (One by Peter Suber, and the other by Walt Crawford) a while ago, but I haven't been able to blog about them until now. I was thinking of comparing and contrasting the two books, but I think it will be easier to just pull out my favorite parts from each book separately. This is a pretty quick read. I usually take forever to read books, and I read this is just two days. I am sure a fast reader could whip through this in an afternoon. Walt begins with a section on Who Cares? He clearly explains why librarians of all stripes and flavors should care about understanding the basic underpinnings of OA. Here are some quotes and insights that struck me. Les Carr, repository manager at the University of Southampton, noted that "Repositories are hard work because changing researchers' working practices is hard work and I guess there's no single magic solution that's going to make that efford disappear." (Page 32-33.) In other words, it takes more work than just setting up a computer with some software on the Internet somewhere. It takes work to get scholars to change their workflows and practices. In the section on Why Change? Walt said that in order to get scholars to change their practices, "They need to prefer OA journals for new papers when that makes sense. They need to deposit existing papers and assure that they have (and use) the rights to deposit new papers when OA journals don't make sense. Librarians need to have scholars change, but scholars need reasons to change. That's an ongoing issue for librarians and libraries, one where you can't do it yourself but need to take part in moving things forward." (Page 37) Yes, we need some good carrots to lead scholars to change their behavior. Chapter 4 addressed controversies. Walt noted in the section concerning "Researchers already have all the access they need" that Alan Adler claimed "there is no crisis in the world of scholarly publishing, or in the dissemination of scientific materials." (Page 49.) Of course this is wrong. Even the largest institutions in first world countries (Harvard, for example) do not provide access to all of the materials that are needed by their students and faculty. Walt also did a good job addressing responses such as "The public can always get access to articles from the public libraries" and that "Scholarly articles are intended for other scholars and world just confuse laymen." (Page 50.) Many other misunderstandings are addressed. How much publishing is there in a particular discipline? What are the ways to estimate the number of articles or pages publishing in that discipline? What percentage of that corpus is available as OA, either green or gold? What percentage of papers are CC-By, CC-By-NC or other? What are the business models of various journals or publishers who do not have author-side fees? How are researchers responding to funder and university policies? Do these policies change where they submit their work? In a way, I see Walt's book as the practical book of Open Access for librarians. The next book covers more of the philosophical underpinnings. If you want see or hear more from the author, here are some good audio and video clips of Peter talking about the book. Here are some good sections of the book. Peter noted that scholars "don't do it [publish articles] to earn profits from the results. They are all nonprofit. They certainly don't do it to make scholarly writings into gifts to enrich publishers, especially when conventional publishers erect access barriers at the expense of research." (Page 14.) Yes, scholars should not be working to provides profits to the commercial publishers. On page 18, it was noted that Tim O'Reilly said that "OA doesn't threaten publishing; it only threatens existing publishers who do not adapt." "OA isn't an attempt to punish or undermine conventional publishers. OA is an attempt to advance the interests of research, researchers, and research institutions." (Page 24.) My comment to this would be that if conventional commercial publishers are undermined, I would not be heartbroken. On page 25, Peter noted that the "publishing lobby sometimes argues that the primary beneficiaries of OA are lay readers, perhaps to avoid acknowledging how many professional researchers lack access, or perhaps to set up the patronizing counter-argument that lay people don’t care to read research literature and wouldn’t understand it if they tried." "OA is a kind of access, not a kind of editorial policy. It's not intrinsically tied to any particular business model or method of digital preservation." (Page 103.) Many scholars know about some of the larger OA journals that have author-side page charges, but they don't know that roughly 70% of all OA journals do not have author-side fees. "As the late Jim Gray used to say, 'May all your problems be technical.'" (Page 112.) Yes, the technical problems of publishing open access journals and articles have been solved, but we still have the social problems of getting more and more scholars to understand and support the OA ecosystem. Also on page 112, Peter noted that OA could include "the whole shebang" of knowledge claims, proposals, hypotheses, conjectures, arguments, analysis, evidence, data, algorithms, methods evaluations, interpretations, discussion, criticism, dissent, summaries and reviews, and more. On page 115-116, he covered who needs OA? "It's easy to agree that not everyone needs it. But in the case of OA, there's no easy way to identify those who do and those who don't. In addition, there's no easy way, and no reason, to deliver it only to those who need it, and deny it to everyone else." He continued with "OA allows us to provide access to everyone who cares to have access, without patronizing guesswork about who really wants it, who really deserves it, and who would really benefit from it." The rest of pages 116-117 continues to counter the argument about lay readers not needing access to research.